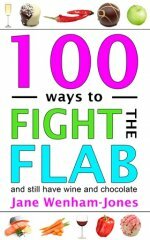 100 helpful and humorous ways to fight the flab from Jane Wenham-Jones, best-selling author and columnist. Jane Wenham-Jones is the author of four novels – Raising the Roof, Perfect Alibis, One Glass Is Never Enough and Prime Time which have received wide acclaim. She also writes for women’s magazines and the national press and has a humorous weekly column in her local newspaper. Brilliant fun read and very useful advice! Great fun and useful too. Highly recommended! Lots of fun and very rewarding. Way Hey Check this out ! An extremely helpful and humorous book. Great tips and easy to read! Brilliant book. Easy to read and very informative! Great ideas for dieting without excess pain. Humorous and serious simultaneously. A good read. A lovely mix of sensible and zany ideas. (I had one idea in this book but it seems to have got lost in the edit. Still a good read. Superb book. Informative and entertaining.